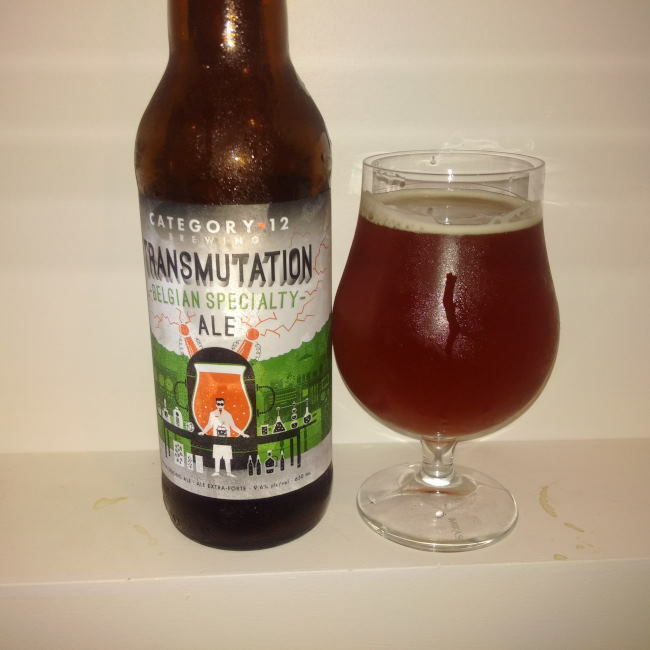 From Victoria’s Category 12 Brewing comes their “Transmutation Belgian Specialty Ale” a Belgian Tripel with their home made Belgian amber Candi sugar. The beer pours a cloudy deep amber colour with an off white head. The aroma consists of dark fruits, candied sugar, sweetness, yeast and alcohol. The flavour is of dark fruits, earth, candied sugar, caramel, toffee, sweetness, yeast, hops bitterness and some resin in the finish. The alcohol content comes in at 9.6% with an unspecified IBU. This beer is basically a West Coast Belgian Tripel with candied sugar. If this sounds good to you then it will be right up your ally. I usually find Belgian Tripels to sweet so this was a nice change for me. Commercial Description: At 9.6% ABV, Transmutation has been a labour of love to make one of our personal favourites, for without it we would likely not have a brewery (it is Karen’s love of Belgian beer, and this beer in particular, that acted as a gateway into both beer and the eventual support of a massive career-switch… we’re not sharing how many glasses that took!) Our family day weekend consisted of hours of making our own Belgian amber Candi sugar, which imparts both an amazing colour and amped-up ABV without increasing body. Combined with triple the amount of malt that goes into a standard Trappist “Single”, you’ll find this beer complex, spicy, and fruity with a sweet finish. We use a generous amount of Noble and Northwestern hops, which are balanced by the malt to create a full, creamy mouth feel. Deceptively potent and delicious, it’s a very limited run, so get it while you can! This entry was posted in Belgian Tripel, Imperial and tagged bc, belgian amber candi sugar, belgian style tripel, belgian tripel, bitter, bitterness, canada, candi sugar, caramel, category 12 brewing, craft beer, dark fruit, dark fruits, earth, earthy, hopped, hops, hops bitter, hops bitterness., hopy, resin, sweet, sweetness, toffee, Transmutation Belgian Specialty Ale, tripel, victoria, yeast.